Though this fault is expressed topographically as a “wall,” it’s not a scarp. This is a case of differential weathering, where the footwall shales are more easily etched away by the stream, and so the hanging wall carbonates stand proud of the landscape. 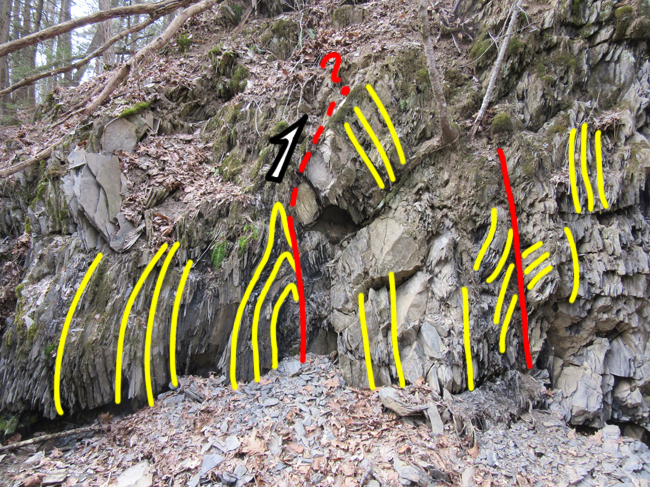 Because graded bedding looks different at the bottom of the bed than the top, it can be utilized as a ‘geopetal’ indicator – a clue about ‘which way was up’ when these strata were deposited. This is very useful thing to know when you’re doing geologic mapping. At Brock’s Gap, the strata are vertical or slightly overturned, younging to the west. There were tectonic structures to behold, too. Here’s a folded turbidite, showing more fracturing on the outer part of the arc than the inside. This is typical of the folding of relatively competent layers – outer arc extension is accommodated partially by cracking. The cracks are subsequently filled with mineral deposits – and then they are veins. We then climbed up onto North Mountain, and were examining slices of rock that had galloped all over each other (“horses”) along the North Mountain Fault system. I learned a new clue for locating a fault in this heavily vegetated land: look for travertine suddenly appearing the creeks! Travertine is freshwater limestone with a distinctive spongy appearance. It’s a common feature in creeks in Virginia’s Valley & Ridge province where the creek gains some of its discharge via the groundwater, and the groundwater has been in the business of dissolving subterranean limestone before flowing out at the surface. Faults act as preferential fluid flow pathways, shunting this CaCO3-rich water into the creeks, where agitation makes it precipitate out, building up ledges like the ones in the photo above. We entered the Brallier Formation, and saw some nice examples there of overturned cross-bedding, indicating these strata have been tectonically inverted. Finally, we climbed out of the Devonian (Acadian) “flysch” and into the “molasse”: redbeds of the Foreknobs or Hampshire Formation, though it was hard to make the call which one it was at this particular outcrop. There were some nice ripple marks there, though. They were so sweet that I willingly braved a thicket of thorns on an unstable shaley slope in order to get the 360° panorama of them in close-up. All told, it was an excellent day in the field – as you can tell from the ancillary qualities of these images, the weather was sunny and mild, and there was minimal vegetation to obscure the lovely geology. Thanks to Matt and Randy for organizing the field review, and letting me tag along!